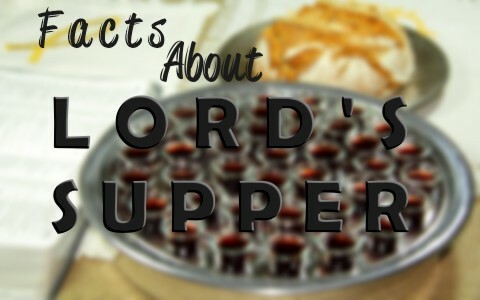 What are some interesting facts about the Lord’s Supper that some people may not know about? Here are five interesting facts about the Lord’s Supper. What Was Wrong with the Old Covenant? The author of Hebrews and most Christians understand that the New Covenant is a better one because it is superior to the Old Covenant which is why he writes “But as it is, Christ has obtained a ministry that is as much more excellent than the old as the covenant he mediates is better, since it is enacted on better promises” (Heb 8:6). It is better because it contains better promises…that instead of sin being covered, sin is taken completely away. Instead of continual sacrifices, day after day, there was one sacrifice sufficient for all and for all time, thus the meaning of Jesus saying “This cup is the new covenant in my blood, which is poured out for you” (Luke 22:20). This was spoken of in the Old Testament by men like Jeremiah who wrote “They will come and bind themselves to the LORD in an everlasting covenant that will not be forgotten” (Jer 50:5). It is better because the Mediator is better for “there is one God and one mediator between God and mankind, the man Christ Jesus” (1 Tim 2:5) and “In speaking of a new covenant, he makes the first one obsolete. And what is becoming obsolete and growing old is ready to vanish away” (Heb 8:13). The Old Covenant, as good as it was, couldn’t permanently atone for our sins which is why we needed a New and better Covenant. Read more about this better covenant made possible by the Perfect Mediator and High Priest, Jesus Christ, in Hebrews 8. Taking communion or the Lord’s Supper is not just a nice idea but it is an imperative command given by Paul and more importantly, by Christ Himself. Jesus said “Do this in remembrance of me” (Luke 22:19c) not “When you have time” or “If you think of it.” That’s why many who do not attend church may miss out on this commanded event. Yes, they can take communion with others in their home but is it really the same? I see no single occurrence anywhere in the New Testament where a believer took communion or the Lord’s Supper alone. Paul’s teaching that communion should be limited to the local church is found in 1st Cor. 11:18-20 “When you come together in the church.” The structure of this sentence implies that it’s also commanded of believers (the church). Paul, by writing this, shows that they came together as a church to observe the Lord’s Supper so it is a church ordinance by repeating exactly what Christ said “Do this in remembrance of me” (1 Cor 11:24). Before we have communion or the Lord’s Supper in our church we announce the date because this allows members to examine themselves ahead of time for the purpose of taking it in a worthy manner. I understand that none of us are really worthy but what Paul means by this is what he wrote in 1st Corinthians 11:28 “Let a person examine himself, then, and so eat of the bread and drink of the cup.” This warning comes because of what he wrote previously that whoever “eats the bread or drinks the cup of the Lord in an unworthy manner will be guilty concerning the body and blood of the Lord” (1 Cor 11:27) because if “anyone who eats and drinks without discerning the body eats and drinks judgment on himself” (1 Cor 11:29). Some in the church at Corinth had failed to do so and what was the result? Paul wrote that this is “why many of you are weak and ill, and some have died” (1 Cor 11:30). Think God doesn’t take this seriously? Consider the underwriting cost of this communion; Christ’s own body broken for us and Christ’s own blood, poured out for us. How then could we ever take it lightly by failing to examine ourselves, discerning the body and the blood? Why would Jesus desire so deeply the coming Passover meal when He knew what was to follow? He gives part of the reason in Luke 22:15-16 “I have earnestly desired to eat this Passover with you before I suffer. For I tell you I will not eat it until it is fulfilled in the kingdom of God.” The Greek word for “earnestly” is not a good translation because this word is from the Greek word “epithymia” and means having a “desire, craving,” and “longing” for. I believe that the reason Jesus so deeply desired to take this meal was that it looked forward to the coming of the kingdom of God and was part of the fulfillment of the coming kingdom of God which explains why He said “For I tell you that from now on I will not drink of the fruit of the vine until the kingdom of God comes” (Luke 22:18). I would think that’s something that we all look forward too. Paul wrote that we are to take the Lord’s Supper as a memorial or remembrance of Christ (1 Cor 11:25). Not a remembrance so that we won’t forget Who He was but a remembrance of just how great a price He paid, thus Paul writes “For as often as you eat this bread and drink the cup, you proclaim the Lord’s death until he comes” (1 Cor 11:26). Paul also wrote “Henceforth there is laid up for me the crown of righteousness, which the Lord, the righteous judge, will award to me on that Day, and not only to me but also to all who have loved his appearing” (2 Tim 4:8) and all who do “get a crown that will last forever” (1 Cor 9:25) and that is “an inheritance that can never perish, spoil or fade. This inheritance is kept in heaven for you” (1 Pet 1:4). Jesus commanded the partaking of the Lord’s Supper or communion. So did Paul. We know it is a non-negotiable thing for the church and for every Christian. We have to examine ourselves, we must partake of His broken body and blood in the wine (or grape juice) and the unleavened bread (or crackers) as doing it in remembrance for all He sacrificed. This proclaims or tells others and ourselves that He is coming again. Are you ready? Today is a good day to be sure (2 Cor 6:2). More reading here: Should Children Take Communion?